It was already confirmed that Samsung won't be launching the Samsung Galaxy S8 and S8 Plus at the MWC 2017, instead, the company is planning to announce them at an event in NewYork on March 29. Rumors are making rounds over the internet regarding the upcoming flagship phone from the company, but until now we haven't seen a clear look at the phones. 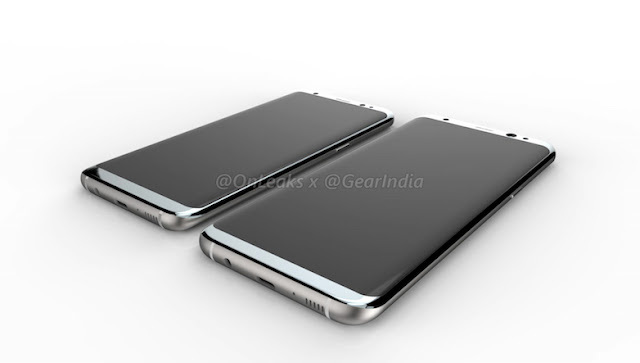 But, that's going to change today, thanks to OnLeaks and Gear India for leaking the clear renders of the S8 and S8 Plus. Looking at the images, it is pretty much clear that Samsung will be using the same metal and glass body with the S8 as well and the display is now dual curved on both sides, which is the first time we see it from Samsung. The Galaxy S8 will sport a big 5.7-inch screen, whereas the S8 Plus will feature a 6.1-inch display. The phone will use a USB Type-C port and will have an awkwardly placed fingerprint sensor beside the camera module. This renders also confirmed that there won't be any dual camera at the rear side of the phone.